CUaware-Winston Salem's "Lunch and Learn"
CUaware Triad is hosting a lunch and learn on February 17, 2016. 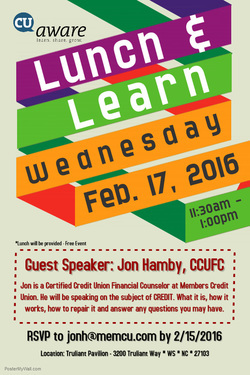 Guest Speaker, Jon Hamby, will be speaking on the subject of credit. What it is, how it works, and how to repair it. Lunch will be provided free of charge for all attendees. Lunch will be served at 11:30am and the presentation will begin at 12:00pm. Contact Jon Hamby at jonh@memcu.com by February 15, 2016 to RSVP, or with any questions.